"Early in the eighteenth century there went to Mexico from France a boy of sixteen named Joseph de la Borde. By his fortunate mining venture at Tlalpujahua, Tasco, and Zacatecas...he made a fortune of forty million pesos. 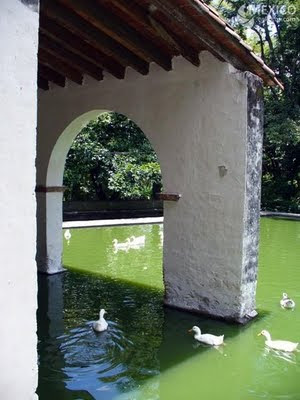 One of these millions he spent in building a church at Tasco, and another he spent in building a garden at Cuernavaca." 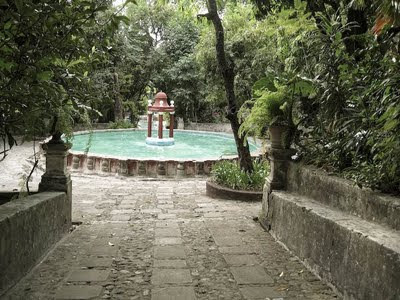 "It lies on a steep hillside behind Cuernavaca, and even it it were not one of the most beautiful of tangled, neglected, ruined old gardens anywhere, it would be lovable for the manner in which it tried so hard to be a French garden and failed. 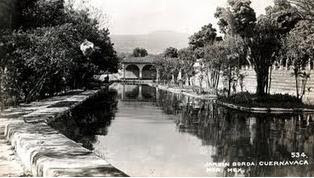 Joseph, it is clear, had the French passion for formalizing the landscape--for putting Nature into a pretty strait-jacket; but although he spent much time and a million pesos in trying to do this at Cuernavaca, he rather wonderfully did not succeed." "The situation, the flora...the walls, the fountains, the summerhouses, the cascades, and the ponds...all combine to give the place an individuality, sometimes Spanish, sometimes Mexican, but French only in a...remote manner..."
"It hangs precipitously on the side of a ravine when it should have been level (one is so glad it is not), and the dense, southern trees--mangoes and sapotes and Indian laurel--with which it was planted, have long since outgrown the scale of the place, interlaced and roofed out the sky overhead with an opaque and somber canopy...In its impermeable shade there are long, islanded tanks in which many numerous families of ducks and geese live a strangely secluded, dignified, aristocratic existence--arbors of roses and jasmine, and heavy, broken old fountains that no longer play and splash." "In seventy-five or a hundred years there will be many fine old formal gardens in the United States--finer than the Borda ever was. 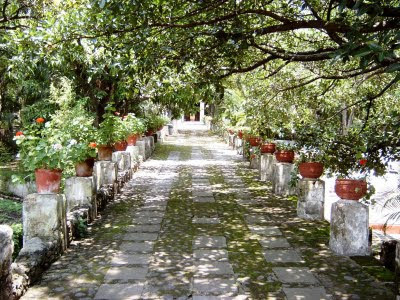 Under the pergolas of some of them there is much tea and pleasant conversation and one greatly admires their marble furniture imported from Italy--their careful riot of flowers. But at present it is difficult to forget that their prevailing color is wealth, and to forget it will take at least another century. If they have everything that Joseph's garden lacks, they all lack the thing it has. For in its twilit arbors and all along its sad and silent terraces there is at any hour the same poetic mystery...[of the] Borghese garden in Rome. The Borghese is extensive and the Borda is tiny, but history has strolled in them both and they both seem to have beautiful, secret sorrows." 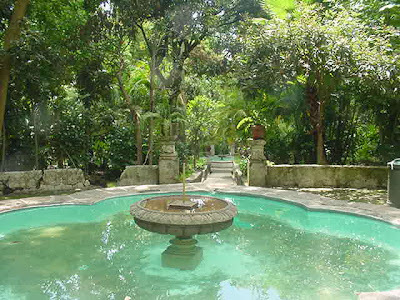 El Jardin Borda, used by the Emporer Maximilian as a summer home during his short and ridiculous reign in the 1860s, once hosted Austrian, French, and Mexican nobility who went rowing in the moonlight on its artificial lake. Now taken over by the state and used as an outdoor theatre and market, a 1987 renovation seems to have vanquished the overgrown atmosphere that captivated Charles Macomb Flandrau. Flandrau was a wealthy and well-traveled eldest son of fine family, an acquaintance of F. Scott Fitzgerald, and a celebrity already by age 26 for his Harvard Episodes (detailing the escapades of privileged young men such as himself within the ivied walls) before he went south to visit his brother's coffee plantation and write Viva Mexico. His mention of American formal gardens having the 'color of wealth' is undoubtedly a reference to the Italianate landscapes being created up and down the East Coast by the noveau riche of the American Country House era, with whom he was well acquainted. A series of 1904 photographs by C.B. 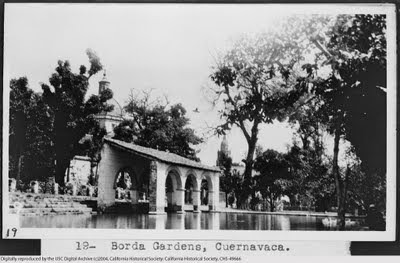 Waite in the Rene D`Harnoncourt Photograph Collection at the University of Texas captures the Mexico Flandrau writes of, though unfortunately at low resolution, including the two small photos of the Borda garden as was, below. "... it is difficult to forget that their prevailing color is wealth" -- ouch! But how many gardens I see in magazines do have that particular colour! THank you for sharing this particular garden with us. Even renovated, it looks delightful. Your blog continues to be wonderful. I look forward to every post. Did you travel to the Mexico garden in this entry? Have you read the Brother Gardeners? I'm working my way through it - fascinating read. Unfortunately I've never been to Mexico...I was reading the Viva Mexico book (it was a favorite of Florence Yoch's, who I posted about earlier) and was intrigued by the description and did some further research. I have indeed read the Brother Gardeners (the publishers were kind enough to send me a copy) and very much enjoyed it...there were several items I intend to blog about when I get the chance!